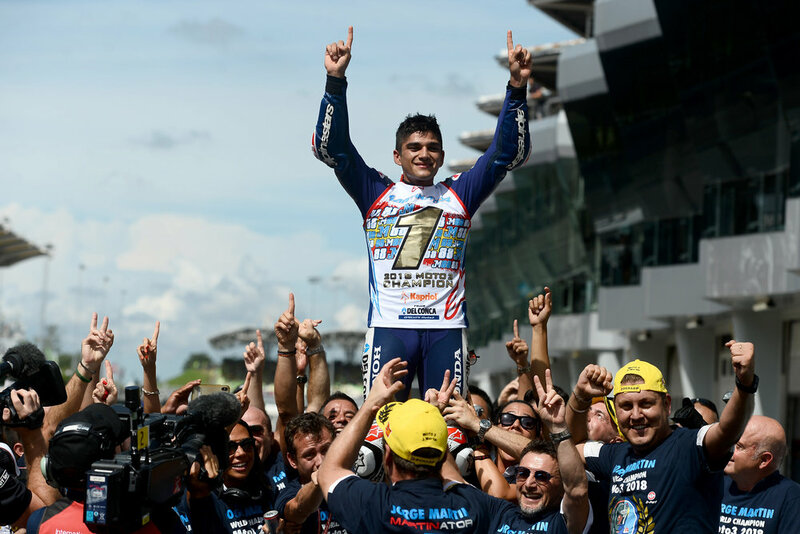 Jorge Martin (Honda) sealed the FIM Moto3 World Championship in style with his seventh victory of the season at the penultimate round in Malaysia. Martin was a frontrunner throughout the season but the Spaniard had to weather the ups and downs of a tense year of competition to come out on top against key rivals Marco Bezzecchi (KTM) and Fabio Di Giannantonio (Honda). Martin made his debut on the world stage in 2015 but emerged as a serious title threat two years later, when he picked up the first of nine podiums in the opening round of 2017 in Qatar, as well as posting nine pole positions. After proving that the speed was there, a maiden victory in the final round at Valencia showed that he was ready to challenge for bigger things in 2018 and the 20-year-old did not disappoint. The year began perfectly with victories in Qatar and Texas but incidents with other riders at Jerez and Le Mans resulted in two DNFs and threatened to undermine his season as Bezzecchi hit form. More wins at Mugello, Assen and Sachsenring sandwiched another zero in Catalunya before disaster struck at Brno as the Spaniard broke his left wrist in FP1. Incredibly, Martin returned to the track just a week later in Austria, taking a stunning podium finish in a race won by his great rival to keep himself in the hunt. The pendulum continued to swing between Martin and Bezzechi, both riders collecting more wins and zeroes, before eventually a crash for the Italian at Phillip Island gave the Spaniard his title shot. Di Giannantonio had scored two wins and six podiums to keep himself in contention but after another incredible race, Martin pulled the pin to perfection and with Bezzecchi in fifth and Di Giannantonio sixth, he could celebrate an emotional title. 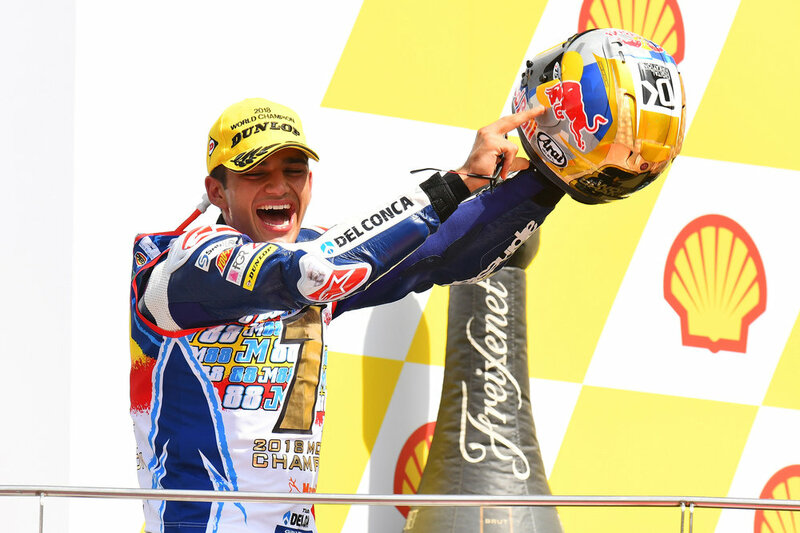 Jorge Martín is the fourth Honda rider to win the FIM Moto3 World Championship title and the third rider from Spain after Maverick Viñales, Álex Márquez and Joan Mir.